I guess I can say that I finally accomplished something this past weekend. Here are the pictures I took at the Celebrator Beer News 20th Anniversary Party in Oakland, CA two weekends ago. 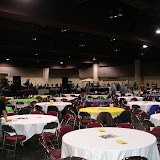 It was on 2/17/08 at the Marriott & Convention Center. I could have spent more time with notes, but I'll instead let the pictures do the talking. Needless to say, it was a great time and my first major beer festival on the other coast. But, since you know that I can't leave without sharing at least a few notes, here goes in bullet format, no particular order. Does Zydeco ever get old? Never thought I'd hear me say a festival was well attended, but the space was too big!